This is the covenant that is the word; the covenant made to Avraham is the oath made to Yitschaq, which is the law (chôq) for Ya’aqov and an everlasting covenant to Yisra’el. It is interesting that the dimensions of the heavenly Yershaliym (as interpreted by Gil Broussard) are the exact dimensions of the covenant land grant. This land grant represents first Eden (within the circle) and second, the promised land by definition (the square). 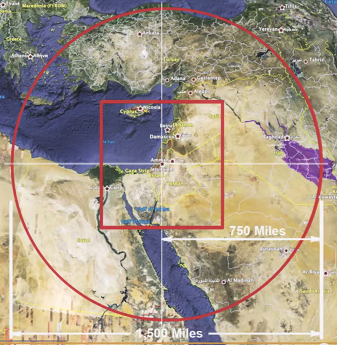 It is interesting that the land of Eden includes the land of Midian in Saudi Arabia as far as Medina (but excludes Mecca), and includes all seven called out assemblies of the cepher Chizayon. The land grant itself (the square) includes Damascus, but excludes Allepo; it includes Latakia, Tripoli, Biblos, Beirut, and the entirety of the island of Cyprus, but excludes Antioch. It includes all of Goshen, the Sinai and all of the nation of Jordan, but excludes Ethiopia and Iraq. If there is anything to be said about the Holy Land grant in its ultimate disposition, is that right now, it is hopelessly divided. Cyprus is divided between Greek and Turk. Syria is in a civil war that has seen over 250,000 deaths. The northern portion is divided between Syria and Lebanon; Syria is divided between Sunni and Shia; Lebanon is divided among the lawful government and Hezbollah; the Transjordan is divided between Israel and Jordan; Israel is divided between Jewish territory, the west bank and the Gaza strip; there is civil war in the Sinai; and there is political trouble in both Egypt and Saudi Arabia. Nonetheless, here is the birthright of the children of Yisra’el, expressed in a covenant that passed by oath and blessing from Avraham to Yitschaq, from Yitschaq to Ya’aqov, from Ya’aqov to Ephrayim and Menashsheh, whose birthright is not to be reckoned. (Dvrei Hayamiym Rishon 5). How has this covenant fared? YAHUAH said also unto me in the days of Yo’shiyahu the king, Have you seen that which backsliding Yisra’el has done? she is gone up upon every high mountain and under every green tree, and there has played the harlot. 7 And I said after she had done all these things, Turn you unto me. But she returned not. And her treacherous sister Yahudah saw it. 8 And I saw, when for all the causes whereby backsliding Yisra’el broke wedlock I had put her away, and given her a cepher of divorce; yet her treacherous sister Yahudah feared not, but went and played the harlot also. 9 And it came to pass through the lightness of her whoredom, that she defiled the land, and broke wedlock with stones and with stocks. 10 And yet for all this her treacherous sister Yahudah has not turned unto me with her whole heart, but feignedly, says YAHUAH. 11 And YAHUAH said unto me, The backsliding Yisra’el has justified herself more than treacherous Yahudah. Well, this is interesting, for it appears in this passage that YAH gave certificates of divorce to both the house of Yisra’el and the house of Yahudah. This passage becomes even more interesting when you consider how YAHUAH transitions in this passage – transitioning from husband (ba’al) to father (ha’ab) and postponing the realization of the covenant for another day. Go and proclaim these words toward the north, and say, Return, you backsliding Yisra’el, says YAHUAH; and I will not cause my anger to fall upon you: for I am merciful, says YAHUAH, and I will not keep anger forever. 13 Only acknowledge your iniquity, that you have transgressed against YAHUAH your ELOHIYM, and have scattered your ways to the strangers under every green tree, and ye have not obeyed my voice, says YAHUAH. 14 Turn, O backsliding children, says YAHUAH; for I am married unto you: and I will take you one of a city, and two of a family, and I will bring you to Tsiyon: 15 And I will give you pastors (ra’ah – shepherds) according to my heart, which shall feed you with knowledge and understanding. A brief word on the term interpreted as pastors. In the Hebrew, the word is ra’ah. In the modern Hebrew, it is often said as ro’eh. Should a person write this in accord with the strict pronunciation, the word would be spelled roi. Compare with the French term for king: Roi (the king, LeRoi). The number of the remnant – one of a city; two of a family – is really quite small, for many are called, few are chosen. (Mattithyahu 22:14). And it shall come to pass, when ye be multiplied and increased in the land, in those days, says YAHUAH, they shall say no more, The Ark of the Covenant of YAHUAH: neither shall it come to mind: neither shall they remember it; neither shall they visit it; neither shall that be done anymore. 17 At that time they shall call Yerushalayim the throne of YAHUAH (kissay YAHUAH); and all the nations shall be gathered unto it, to the name of YAHUAH, to Yerushalayim: neither shall they walk anymore after the imagination of their evil heart. 18 In those days the house of Yahudah shall walk with the house of Yisra’el, and they shall come together out of the land of the north to the land that I have given for an inheritance unto your fathers. 19 But I said, How shall I put you among the children, and give you a pleasant land, a goodly heritage of the hosts of nations? and I said, You shall call me, My Father; and shall not turn away from me. How beautiful is his name upon the mountains! Here, YAH asks the question: How shall I give you the pleasant land – the goodly heritage of the hosts of nations (tsava goyim)? And here, YAH answers the question: You shall call me, My Father (Avi); and shall not turn away from me. Behold, the days come, says YAHUAH, that I will make a Renewed Covenant with the את (eth)-house of Yisra’el, and with the את (eth)-house of Yahudah: 32 Not according to the covenant that I made with their fathers in the day that I took them by the hand to bring them out of the land of Mitsrayim; which my covenant they broke, although I was a man unto them, says YAHUAH: 33 But this shall be the covenant that I will make with את (eth)-the house of Yisra’el; After those days, says YAHUAH, I will put my Torah in their inward parts, and write it in their hearts; and will be their ELOHIYM, and they shall be my people. 34 And they shall teach no more every man his neighbour, and every man his brother, saying, Know את (eth)-YAHUAH: for they shall all know me, from the least of them unto the greatest of them, says YAHUAH: for I will forgive their iniquity, and I will remember their sin no more. Behold, the days come, says YAHUAH, when I will make a Renewed Covenant with the את (eth)-house of Yisra’el and with the את (eth)-house of Yahudah: 9 Not according to the covenant that I made with their fathers in the day when I took them by the hand to lead them out of the land of Mitsrayim; because they continued not in my covenant, and I regarded them not, says YAHUAH. 10 For this is the covenant that I will make with the את (eth)-house of Yisra’el after those days, says YAHUAH; I will put my Torah into their mind, and write it in their hearts: and I will be to them an ELOHIYM, and they shall be to me a people: 11 And they shall not teach every man his neighbour, and every man his brother, saying, Know את (eth)-YAHUAH: for all shall know me, from the least to the greatest. 12 For I will be merciful to their unrighteousness, and their sins and their Torahless deeds will I remember no more. This statement and restatement (two witnesses) is known as the BRIT CHADASHA – the renewed covenant. How, then, does this take place? 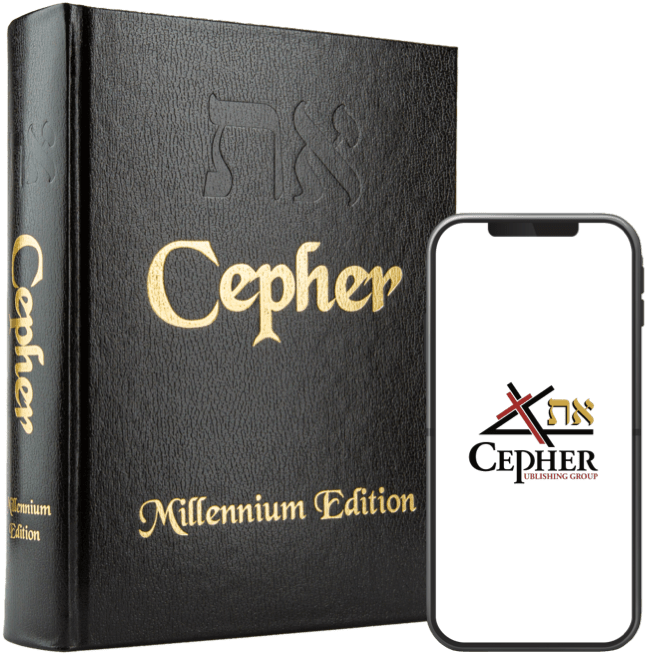 Consider this covenant once again: But this shall be the covenant that I will make with את (eth)-the house of Yisra’el; After those days, says YAHUAH, I will put my Torah in their inward parts, and write it in their hearts; and will be their ELOHIYM, and they shall be my people. Unto your seed have I given this land, from the river of Mitsrayim (the Nile) unto the great river, the river Perath (Euphrates).